"In the game of life, you can't lose 'em all." The film entitled Win Win is about the life of Mike. Mike is a lawyer. He is married to Jackie with whom he has two daughters, Abby and Stella. He decides to take a second job as a wrestling coach. He faces the challenge of striking a balance between the two jobs and being effective in both. Mike persuades the court to assign him as guardian to Leo. Leo is a man suffering from a mental disorder and has no immediate relatives. The court accepts and assigns Mike to take care of Leo. Mike wants this position because of the monthly allowance allocated for the job. Not long after, Leo’s grandson Kyle, who had been away in Ohio for many years, decides to come back home. Kyle is a young man in his teens who is known for his wayward ways. Leo had been moved to a care home, so Kyle could not stay alone in his grandfather’s house. Mike and Jackie ask him to come and live with them. One day Mike sees Kyle trying to steal from his old house. He asks him why he is doing that, and Kyle tells them the story about his life. Kyle’s mother, known as Cindy, is in rehabilitation. She lives with her boyfriend in Ohio, and Kyle tells Mike he does not like them. Mike later finds out that Kyle is a good wrestler and enrolls him in a high school to enable him continue his education. After rehab, Cindy comes back home to claim her father’s property. Kyle is also disappointed to learn that Mike had promised to live with Leo but had instead taken him to a care home. Mike admits his mistakes and stops collecting the monthly allowance offered by the court. He withdraws Leo from the care home but allows Kyle to continue living with them. Mike also finds a new job to support his family. 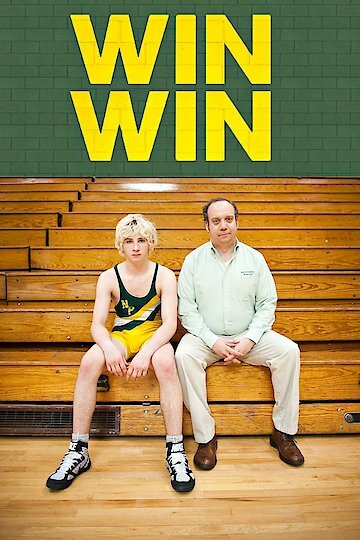 Win Win is currently available to watch and stream, buy on demand at Amazon, Vudu, Google Play, iTunes, YouTube VOD online.